What on earth is this? 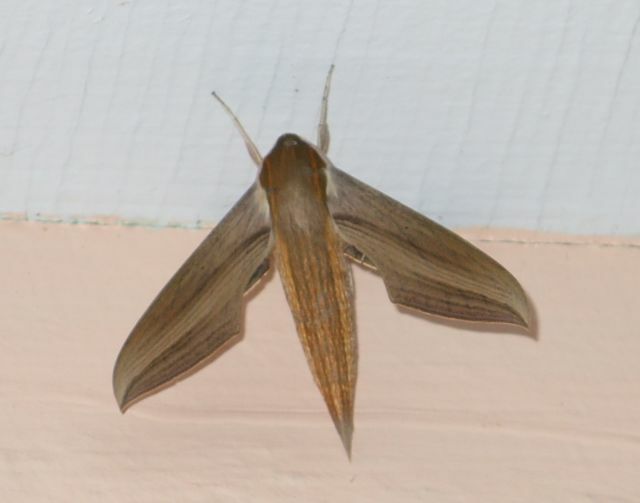 Ok, I'm pretty sure it is a moth. I had never seen one that looked like it was designed by Boeing before, and I am sure that I have that backwards. I saw this near the house a while back and snapped the shot thinking about all the weird wildlife we have around here. It was larger than the usual feed moths that would sometimes get in my Parrot's food, or those little fluttery things in the garden. This moth was about the size of my thumb roughly and I was surprised how streamlined it looked. All the way down to the Ailerons and that tail section, everything looked like the airplanes that would fly overhead screaming on the way to the base. Luckily it was not harmful, not as much as my parrot is when he takes a liking to the woodwork. I've been able to stop him from chewing up the wood here but it takes constant vigilance. As for the moth, as long as he stays outside, he's welcome in the garden.